Auckland heritage tram rediscovered – former Onehunga tram car 53 found at Thames disguised as a bach! We have just bought a Tram (bach) at Thames and over the weekend we took out a few windows in search of the Tram number. To our delight stamped on two window ends was 53 & on two of the surrounds in pen was written Car 53. Yippee – like the birth of a new child! Very exciting. How can we source some information & photos on tram 53. Hope you can assist in our adventure. Tram 53 leaving Gaunt Street depot on its way to Onehunga (Graham Stewart photo). Of the seven E-class cars 50-56, the whereabouts of car 53 and 54 have never been verified, though we know they all ended up in the Coromandel region, transported by Ted Russek in early 1953. Windows from similar tram classes were frequently swapped in the later years just to keep them operational, but from the message there appears that there are enough parts all stamped and written with the same number to safely say it probably is 53. The E-type trams were imported from the Brush Electrical Engineering Falcon Works, Loughborough, England, in 1905 especially for use on the Onehunga route, operating out of the Epsom depot. This class had capacity to seat 56 (a few more than the ‘usual’ 52), and had open fronts and large drop-down saloon originally. When new they were painted in an elaborate chrome-yellow scheme featuring blue and red lining with large scroll-work surrounding the fleet numbers. All were rebuilt to standard Auckland ‘M-class’ design during the Great War to the point where only the chassis, floor, saloon roof and clerestory, and possibly end bulkheads would be from the original car. Materials used as built are European ash for side frames, English oak for internal varnished panelling and mouldings, Burmese teak for windows. The rebuilt tram, as it would be today would be all NZ kauri, except for the floor, which if it ever had been renewed would be rewarewa. with double set windows in the new built sides. The double set windows were a standard fixture of Auckland trams from 1908 right through until the last tram was built in Auckland in the early 1940s. The next major visual change would have been the addition of the “butterfly” double set destination boxes in the 1920s which were unique to Auckland. Graham Stewart will have many photos of the car in service. A photo appears in his book, Always a Tram in Sight, pg. 21, of 50-53 on a paddock (near the Kopu Bridge) at Thames in 1953. Bruce and I have been in cars 51 and 52 (joined together in and L-shape at Tapu). Car 56, a good restoration candidate, as you know is at Barry Brickell’s DCR. This incidentally was the post the Ploms responded to when they posted their original request as a comment. I put Martin Plom in touch with Graham Stewart, Tramway Historian who has the former Auckland Transport Board service records of all the Auckland trams. 53 is one of about 80-90 former Auckland tram bodies still in existence mostly on the Coromandel, but throughout the central North Island in varying conditions. 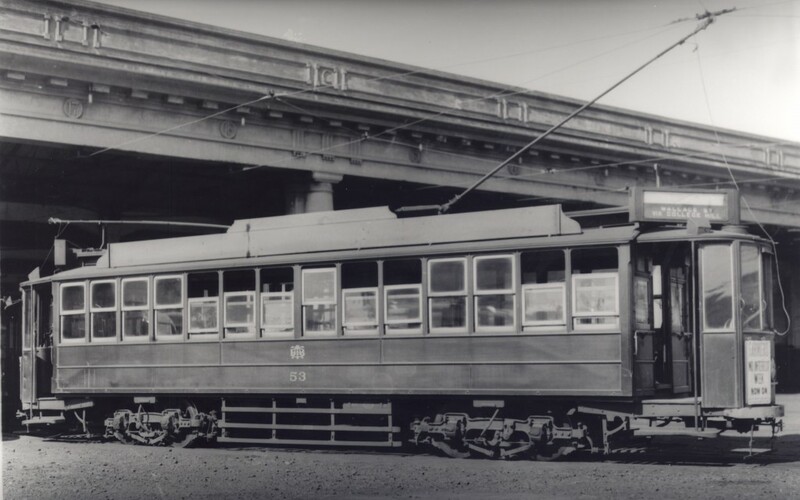 The “E class” trams were modernised, No.15 was rebuilt in October 1914 to match the newer “M type” trams with double set windows in the new built sides. The double set windows were a standard fixture of Auckland trams from 1908 right through until the last tram was built in Auckland in the early 1940s. The next major visual change would have been the addition of the “butterfly” double set destination boxes in the 1920s which were unique to Auckland. The different Auckland tram designs were designated “A type” through “N type”. The most numerous being the “M type which had 99 in the class”. Each a progression in modern tramcar design, then from the late 1920s, the designation changed with new tramcars being ordered and built to the year of design, namely 1929 type, 1930 type, 1934 type, 1937 type etc. The later classes being variants of what became commonly known as the Streamliners, due their streamlined bulging sides. During the tramway days, most of the crews knew the trams only as two and four motor cars, the class designation only being of importance to the maintenance, workshop and drawing office staff. It’s interesting to note the word “car” or “cars” was common tongue in describing tramcars, long before motor vehicles adopted the term. Built by the Brush Electrical Engineering Company Limited, Loughborough, England. No.. 53 was part of an order of seven trams – designated as the ‘E’ class. Glass fronts were fitted in October 1909. Air brakes were installed in July 1911. No.. 53 was completely rebuilt with new style saloon windows in October 1914. The original centre compartment which divided smokers from non-smokers was removed in July 1942. Taken from Gaunt Street depot to the Royal Oak Workshops on Manukau Road for dismantling on 19 May 1953. The stripped body left for Thames on 26 May 1953. The rediscovery has created a lot of interest amongst heritage tram circles and I understand a field expedition to Thames is being organised to meet the Ploms and to closely inspect the rediscovered tram. Thanks to years of dedicated conservation work and the foresight of heritage tram experts and historians like Graham Stewart, Leyton Chan, Bruce Pullar, David Cawood, Jef Grobben and others based principally around MOTAT public awareness and appreciation of Auckland’s trams is growing as Aucklanders perceive trams as part of the city’s heritage and look back to a golden age when Auckland had one of the best public transport systems in the world. For this reason the heritage tramway now in an advanced stage of construction in the Wynyard Quarter is symbolic of Auckland’s past – but also we hope a harbinger of its Light Rail future. Subject: RE: Heritage Tram #53 rediscovered??? You have my VOTE!! Appreciate your response & efforts. PS – you do a great job and we have supported you over the years. 9 Responses to Auckland heritage tram rediscovered – former Onehunga tram car 53 found at Thames disguised as a bach! Mike – amazing – 24 hours and you have solved a mystery. PS – you do a great job and we have supported you over the years and will continue to. Hi, We also have purchased the tram next to Martin and Lynn Plom. The number on the window is 197, do you know any of the history belonging to this tram. I would appreciate any information you can provide. When I was boy in Takapuna, in the 1950s, I lived close by to the Takapuna croquet club and remember seeing a number of wooden slatted seats (each with an upturned ex-w.w.2 British steel helmet on a pole for use as an ashtray) which i believe came from the Auckland tram fleet, around the edges of said croquet field, this used to intrigue me no end. I used to travel on Aucklands trams (like a million other people) from time to time, with my parents, loved it. It was a big adventure for a small boy to travel with his folks, to catch the bus to Bayswater wharf,cross the harbour on a steam powered ferry, then get on the tram and rattle off along Customs St. to Auckland Railway station(I”ll avoid the term “train station!”….oops!) and catch the Ka or Ja class steam locomotive hauled express to Wellington to see Grand parents, wonderful stuff . Now I watch the current construction progress of Surfers Paradises new tramway project (where I now live) , with much interest, due for completion in 2014. May even apply for a drivers job on it! That is great to hear. There are some trams up at Red Beach being used as batches. I am the owner of trams 52 and 52, Onehunga trams. They are situated at 709 Thames Coast Road, Tapu in a T formation. i.e. 2 bedrooms, .w..c. bathroom in one and lounge, kitchen, dining in the other. They are in a group called “Firthview Cabins” with a lovely group of owners. These 2 trams have a lot of original features which most of the others do not have, e.g. windows, doors and bell buttons.